I cannot tell you what I think of this book without spoiling it; that being said, if you have not started it, finished it, or want to sometime read this book in the near future – then stop reading now. I agree with Kathy that there are a lot of irritating parts in this book. Since I am a Jacob fan, Edwards behavior was very irritating and made me love Jacob that much more. Bella was a big push over in this book. She needed to do what she wanted and let Edward deal with it. Everyone is so worried about making everyone else happy. I was surprised that it took so long for the pack and the Cullens to finally figure out there were both on the same side. I really enjoyed the conversation that Edward and Jacob had the night in the tent. One thing I especially loved about this book is we got to know the history of some more of the Cullens – Jasper and Rosalie. Their stories were fascinating to me and I’m so glad that they were included. I secretly hope that Rosalie will have more influence over Bella in the forth book. 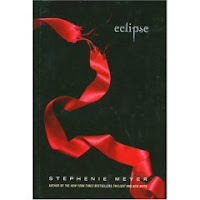 I must insert here that I am very impressed with Stephanie Meyer’s ability to write such an intriguing love story and keep it clean. There are parts that are so intense but the characters keep their morals. So many other young adult authors do not do this. One kiss between Jacob and Bella took up four pages – four amazingly morally clean pages!!! I did not like the epilogue. I don’t like reading in Jacob Blacks perspective, I am used to Bella. I had a sick feeling that Jacob was going to imprint with Leah and then I would have to throw the book across the room and never look back at the series. I’m glad that didn’t happen. At least a girl can hope. I am a Jacob fan too. Especially in Eclipse when they are both there. It is hard for me to not see how much *better* Jacob is as a match. It looks like we share a lot of favorite parts. I loved the back stories of Jasper and Rosalie. And I also loved getting more of the werewolf lore. I had the same horrible feeling that Jacob would imprint with someone. And I didn't want to see that happen especially with someone like Leah. k so there's my opinion for you...like it or not. that's what's great about having people around you who don't think or feel the same way about you...it always makes me think and see things from a different perspective. Your book blog is awesome...keep it up!